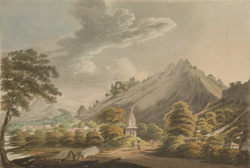 This is plate 11 from 'Hindoostan Scenery consisting of Twelve Select Views in India' by Francis Jukes (1746-1812) and Thomas Anburey (1759-1840). This picture shows a hill fort in Madhya Pradesh with a temple below. Bundelkhand was the old British term for the region in central India consisting of several independent kingdoms. These kingdoms were all located around the northernmost tip of Madhya Pradesh.